It's all about the ART! 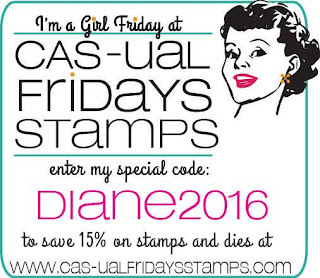 : CAS-ual Fridays and Imagine Crafts Blog Hop! It's all about the ART! CAS-ual Fridays and Imagine Crafts Blog Hop! Hello there, so glad you stopped by today! CAS-ual Fridays and Imagine Crafts are having a blog hop! The Girl Fridays were given the opportunity to work with some amazing Imagine Crafts products, and I'm excited to show you the projects I created. Let's get started, shall we?! This first card uses VersaColor pigment inks, VersaFine ink, and Sponge Daubers. I own mostly all dye inks, but there are SO many cool techniques that you can do with pigment inks that I knew I wanted to start to build a collection of them. I love that the Imagine Crafts VersaColor pigment ink pads come in both regular size and mini, I'm going to collect the mini's so I can get all the colors! 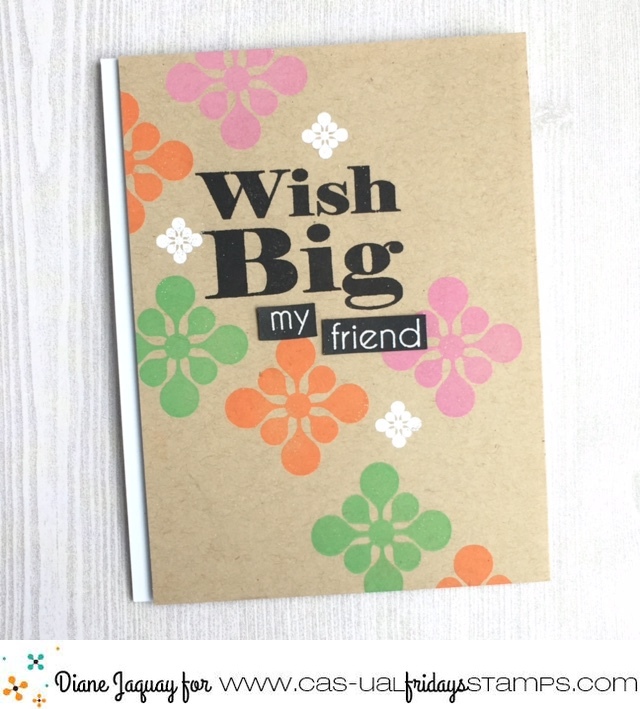 Along with the Imagine Crafts products I used two CAS-ual Fridays stamp sets on this card, Pretty Posies and Wonderful Words. To make my card I started by stamping the flowers and leaves using VersaFine Black Onyx ink. This ink stays wet for just a bit so if you work quickly you can add clear embossing powder on top of it and emboss, and that's what I did here. I wanted to make sure I had no smudging whatsoever when I blended the pigment ink and embossing will ensure that. Next I used the VersaColor pigment inks and Sponge Daubers to add color to my flowers and leaves, dabbing and blending to create the look I wanted. For the large flower in the center I used Petal Pink, Orchid, and Boysenberry, for the medium flowers I used Canary and Orange, for the small flowers I used Sky Blue, and for the leaves I used Fresh Green and Green. I love how you can easily blend these inks to add several colors to your stamped images. Next I cut out the flowers and leaves using Posies Fri-Dies. Because pigment inks stay wet for awhile the next thing I did was add clear embossing powder on top of the flowers and leaves and embossed them. This adds a delicious SHINE to these flowers that I just love!! I tried to capture that shine in my close up shots, I hope you can see it. 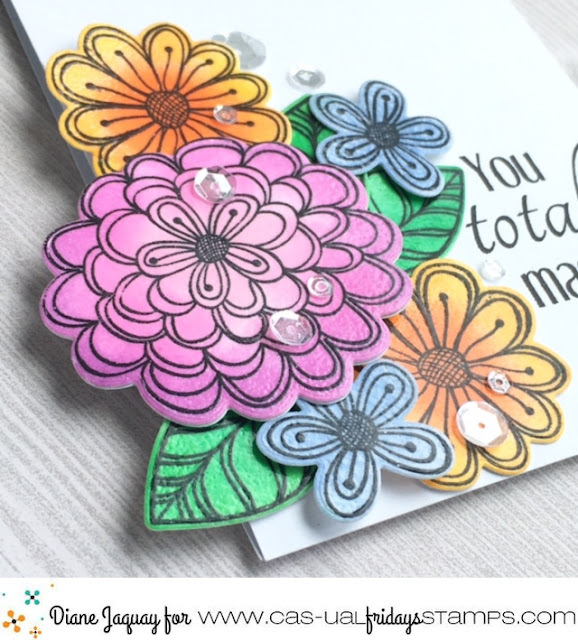 I love shine and bling on my cards, and often use Glossy Accents to coat my projects, but I wouldn't want to do that with all of these flowers and leaves, so this technique is a perfect way to add some shine to your cards and really make them stand out! I arranged the flowers and leaves on the card, stamped the sentiment and added some clear sequins to finish it. Another thing that pigment inks are fabulous for is stamping on Kraft cardstock! For this card I used Bold Wishes and Sassy Smiles stamp sets. The pigment ink colors I used here are Orange, Fresh Green, and Orchid. I will tell you that the very lightest pigment ink colors don't show up quite as vividly on Kraft as the brighter, medium shades, like the ones I used here, although you can still see them. But I love how these colors look on the Kraft paper, don't you?! This is a hop, so of course there are prizes involved! Be sure to comment on each stop along the way in order to be eligible to win one of the two FABULOUS prizes being offered!! The next stop on the hop is the talented RONI JOHNSON! Oh wow! I never think to use my pigment inks with my daubers. I LOVE the look. Your cards cam out fabulous and are so rich with color. Great design. Love all the beautiful arrangement of stamped flowers, so beautiful and love the bold sentiment with a pretty design on second one! Now that is one pretty bouquet you created! Love your second card as well! Beautiful cards - the stamping on the kraft cardstock is great! Looks like you've made a masculine a feminine card with almost the same products. Both are totally stunning. You made my day with the bouquet of flowers. The second card is plain and simple but so pretty too. Two beautiful cards Diane! 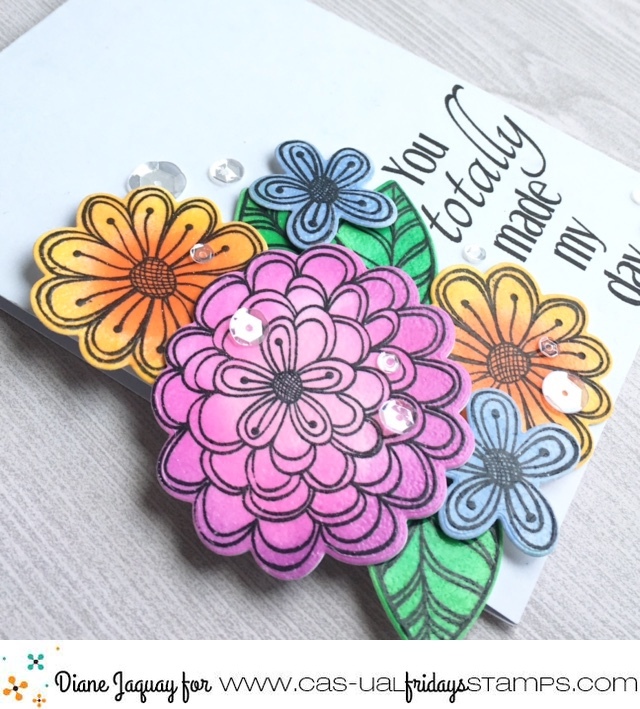 I love the colours of your flowers on the first, I have to get that stamp set!! Such lovely cards! The flowers are beautiful! Awesome job this is gorgeous - thanks for hopping with us!! Beautiful projects Diane! I love the colorful flowers sprinkled with the shiny dewdrops (sequins).. total eye candy for me.. and I LOVE pigment inks - and these are some of the best! Love the flowers and colors on your Pretty Posies card! Great dimension with the layers too! and I love the pigment inks on the kraft paper on your 2nd card! These teo cards are amazing and you have an eye for awesome color combos. Love both of your cards! Both are very pretty! Gorgeous cards! Love the flowers on the first. Fabulous cards Diane and I am especially fond of the first one! Just lovely! Gorgeous! Love the flowers and colors you used. What a sweet pair of cards! I'm in love with those totally gorgeous flowers!! Oh so pretty - LOVE all of your colours! I love those inks. They are so vibrant. Love your stacked flowers with the bright happy colors! Wonderful set of cards. Such pretty cards! I just adore that layered cluster of beautiful blossoms. Love your cards. Flowers are really nice! 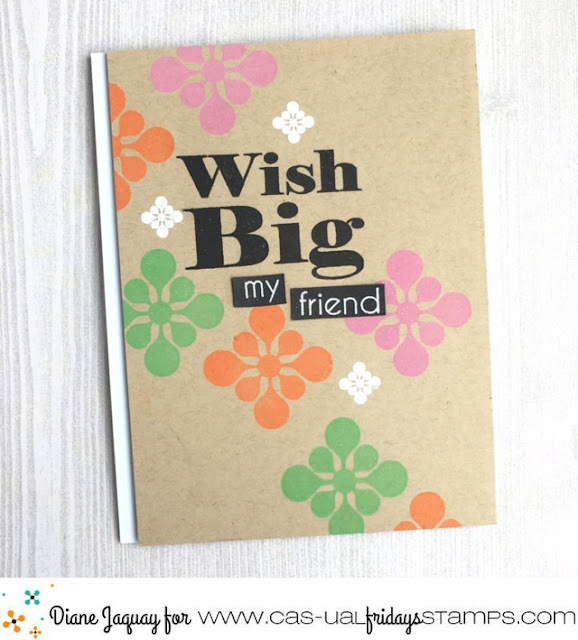 Gorgeous pigment ink colors on these pretty posies and the Bold Wishes on the Kraft is so solid in color, beautiful cards! I see the shine! I like both cards - thanks for sharing! Wow - what an awesome post! 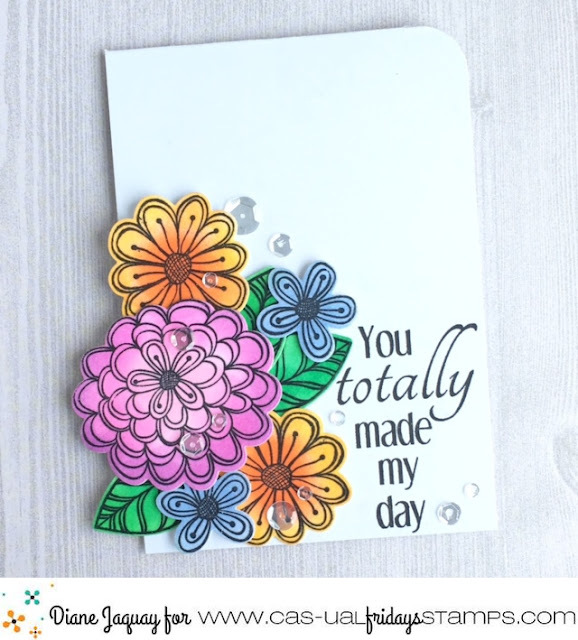 I love the dimension of your first card with the beautiful flowers and the colors you used on your second card. both are wonderful, love the layered flowers! 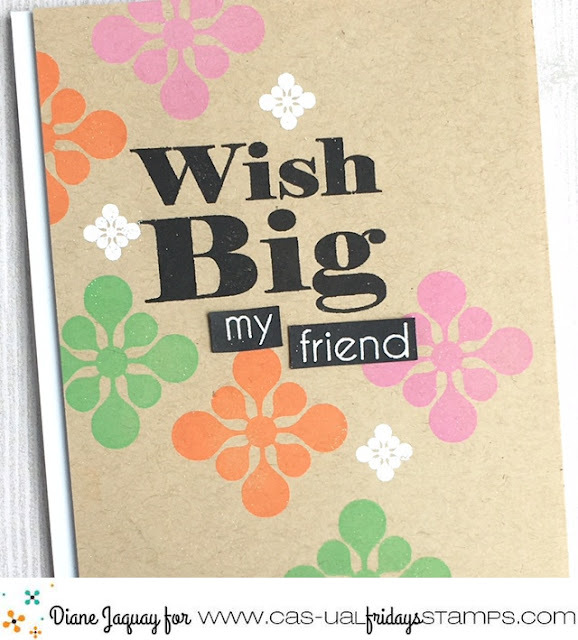 WOW - I must say that it totally MADE MY DAY to see first your beautiful blooms card and then the Make a wish card!! Wonderfully made - both of them!! I am always drawn to floral cards because I don't seem to have a knack for them - So lovely!! You're right, those pigment inks look wonderful on the Kraft card stock!! Great cards! Great colors on both cards. Both are gorgeous, Diane! Love the shine on your blooms! Reverse Confetti Inspiration Station Sneak Peek! Reverse Confetti June Release Blog Hop!